Made in the USA...genuine brass base metal. Limited Edition (limited quantities available). Select lot size and finish from the drop down menu. 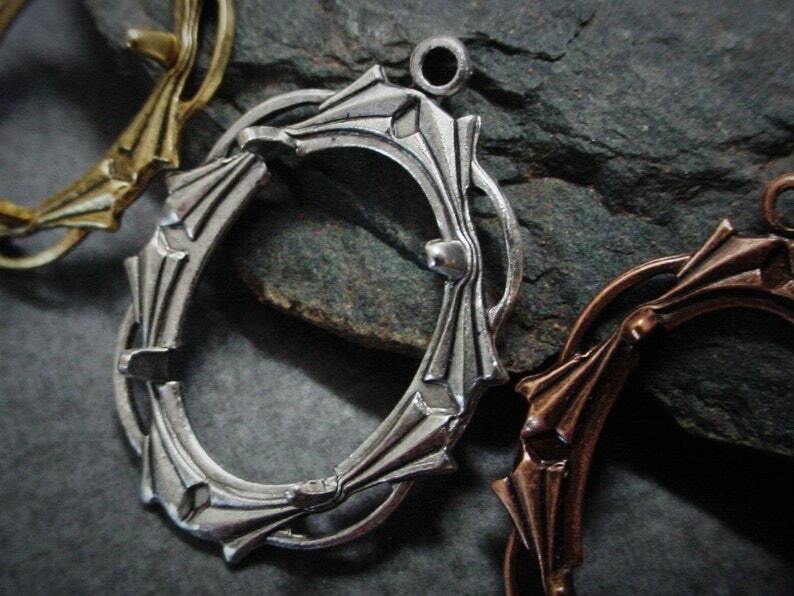 Custom plated in genuine sterling silver, copper or 18k gold. Clear coat sealant provides a tarnish resistant finish. Each setting measures about 1 1/8 inches long including the loop. For any flat back stone measuring 18x13 oval or 18x13 faceted stone/rhinestone if it has a low profile back such as a czech glass rhinestone. Swarovski Crystals have a high profile back and are not recommended for these settings. Made in the USA from vintage tooling. Genuine brass. Nickel and lead free. Made in the USA. Excellent quality, Fast delivery. Very pleased repeat customer.